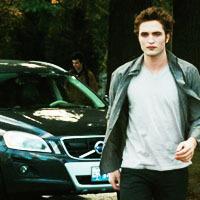 Robert Pattinson as Edward Cullen. ♡♡♡. Images in the 罗伯特·帕丁森 club tagged: robert pattinson robert pattinson twilight edward cullen vampire icons. This 罗伯特·帕丁森 icon might contain 街道, 城市风貌, 城市环境, 城市场景, and 城市设置.